The Daily Chow: Fresh off the Boat! Every so often I get into conversations with foodies, food purists and anti chain store individuals who discuss times and/or desires of having quality food purveyors that actually know where their products came from. One example an Italian friend gave me, that I hear from others often, is that of the local butcher shop, that knew his favorite cuts of meat, where the animal was raised, what it ate and when it died. I also think of it as the "Cheers" experience of shopping and eating, where "everyone knows your name." I recently met the No. 1 Fishmonger, Mr. Tommy Gomes at a Cellar Door dinner, where over 6 delicious courses and among 8 other food lovers, we became friends and shared anecdotes related to food, seafood and how I love fish cheek and the eyes. Within a week, I paid a visit to Tommy at Catalina Offshore Products to pick up two of my favorites, live Amaebi and sea urchin. I was definitely like a kid in a candy store. In addition to the fresh seafood on display, they often have guest chefs come in and cook impromptu dishes to sample. That day it was Chef Christopher Logan from Creative Flavors Catering. Amazing! Being the shy eater I am, I only sampled 6 dishes... ^_^ (salmon, cod, scallops etc.) Also got a great recipe from him for pickled onions. Left that day with a tummy full of good eats and a bag full of half moon scallops, amaebi, uni and salmon. I don't think I'll ever have it in me to pay $13 for 2 Amaebi from Harney, or to buy seafood from anywhere else again. They have amazing fresh seafood and at really great prices. I'll be stopping by there again soon! 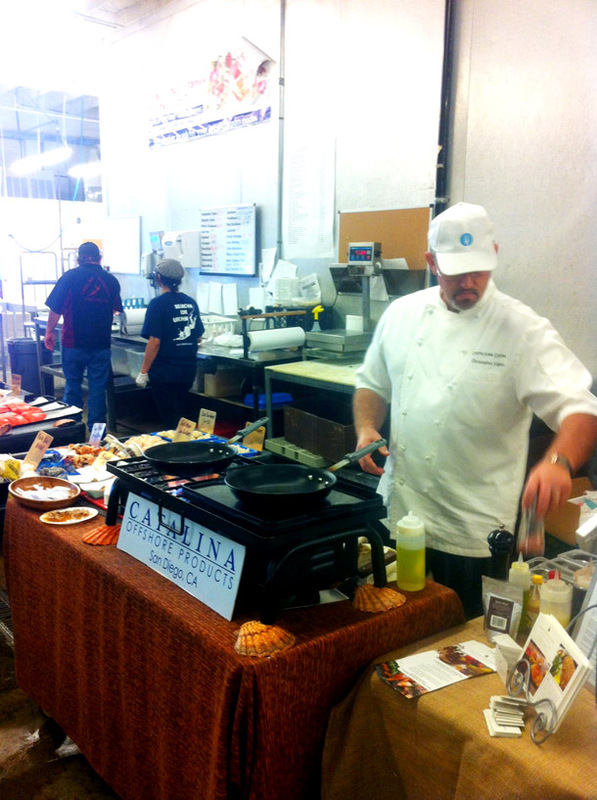 Thanks Catalina for the TLC, tour, recipes, tastes and kickass experience. (and to Cellar Door for bringing us noms lovers together). 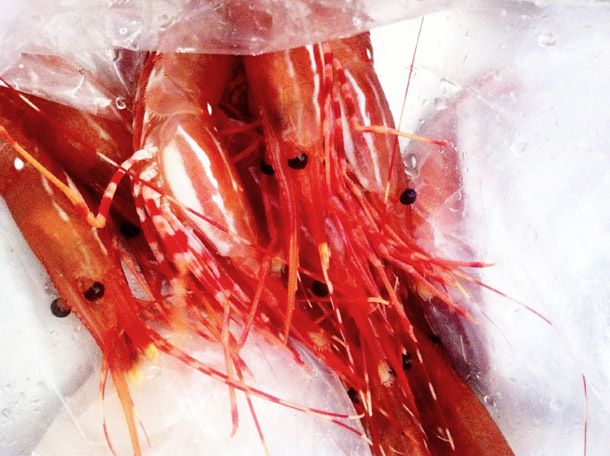 Live Amaebi Sweet Shrimp. Body curl based on time being dead.